Alan shares how he met an angel investor that funded his first restaurant and how they continue to win awards year after year. One lesson is in community giving and support. Chef Alan does a lot for the community and has been recognized with many awards. Learn how helping the community is crucial to your business success. In the world of gourmet cooking, critically-acclaimed Chef Alan Wong is well known for his unique creative flair. A renowned master of Hawaii Regional Cuisine, Chef Wong has made a highly successful career out of marrying elements of different ethnic cooking styles, along with the finest Island-grown ingredients. Fusing French techniques with local and Asian ideas naturally makes for an East West menu. He apprenticed at The Greenbrier Hotel and then went on to Lutece in New York City. His mentor, Andre Soltner, emphasized early in his career the importance of being a “skilled craftsman” and to cook with two feet on the ground. The chef, whose success is due as much to dedication as inspiration, is pragmatic about cooking. “It’s exciting to create food that stretches the palate and exercises the senses-while it’s grounded in the classical foundation, it’s still fun.” His professional philosophy of not being different solely for the sake of being different has stood him in good stead over the years. He opened The Canoe House Restaurant at the Mauna Lani Bay Hotel and Bungalows in 1989. He has participated in all 12 of the “Cuisines of the Sun” events held there every year. In 1991, he was a founding member of the Hawaii Regional Cuisine Chefs, an organized group that works with Hawaii’s farmers, fishermen and ranchers. In 1994, he was named one of 13 Rising Star Chefs in America by the Robert Mondavi Winery for culinary excellence. He is a James Beard Award winner for Best Chef: Pacific Northwest 1996. In April of 1995, he opened “Alan Wong’s Restaurant” in Honolulu. In 1996, he received a James Beard Foundation nomination for the nation’s Best New Restaurant. The restaurant is a six-time winner of the Hale ’Aina Award as the state’s “Restaurant of the Year” and is also a six-time winner of the Ilima Award as Hawaii’s “Favorite Restaurant of the Year”. In September 1999, he opened The Pineapple Room by Alan Wong. Located at Macy’s in the Ala Moana Shopping Center, the restaurant serves breakfast, lunch and dinner, and offers a patisserie bar, as well as banquet and catering facilities. That same year, the chef became a cookbook author publishing “New Wave Luau” (Ten Speed Press). And since 1999, Alan Wong’s Restaurant has continuously received the DiRoNa Award for Excellence. In February 2000, Chef Wong entered a consulting partnership with Aloha Airlines developing in-flight meals. In July 2000, he opened Alan Wong’s Hawaii in Tokyo Disneyland. In 2001, the chef was named Chef of the Year 2001 by Santé Magazine for Wine and Spirits. Alan Wong’s Restaurant was also honored in Gourmet Magazine’s October 2001 issue ranking number six in the nation of America’s Best Fifty Restaurants. Today, the restaurant continues to receive top ratings in Zagat, Gault Millau and Wine Spectator. In March 2002, the Inaugural 2001 Wedgewood Awards honored Chef Wong as one of the ten U.S. chefs nominated for the title of World Master of Culinary Arts. Also in 2002, Nation’s Restaurant News inducted the restaurant into its Hall of Fame. 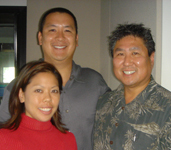 In August 2003, Chef Wong partnered with the Hualalai Resort as a food and beverage consultant, reopening their Club Grille Restaurant as “The Hualalai Grille by Alan Wong” in December 2003. That same September, Bon Appetit Magazine recognized Chef Wong among its culinary legends as the ‘Master of Hawaii Regional Cuisine’. The chef believes in giving back to the community and to the profession. He serves on the board of Easter Seals Hawaii and the Hawaii Seafood Promotion Committee, as well as, the Leeward Community College and Culinary Institute of the Pacific food service programs. He was honored in 2001 by Kapiolani Community College as its Distinguished Alumni and by the University of Hawaii as a Distinguished Alumnus in 2002, both for contributions to the State of Hawaii, and now serves on the board for the University of Hawaii Alumni Association.